I arrived at the Phoenix, Arizona, airport after over two days of travel, exhausted and excited. It was the morning of my first day in the Thunderbird for Good Project Artemis-Afghanistan program at Thunderbird University. It is a two-week program designed to help Afghan businesswomen with business and entrepreneurial decisions. Their goal is to “help to fight poverty, secure peace, and improve living conditions in communities throughout the world by applying the school’s world-class expertise in management education.” I was chosen to attend this incredible program! It was November 2006 and I was one of only thirty women who had been invited to participate in the program since it began in 2005. During the next two weeks I attended classes, met the other Afghan students, got to know my professors and mentors, attended homecoming, classes, gossiped, laughed, cried, went to the gym, met more American students, visited local businesses, went to more classes, met the Afghanistan Ambassador, was interviewed by the media, and even saw the Grand Canyon! Whew! I was more exhausted after two weeks than when I arrived! Finally it is time to go home. It was a whirlwind time and I didn’t have time to even think about my experience. On the long ride to the airport I was finally able to think about everything I learned during my two-week stay at the university. 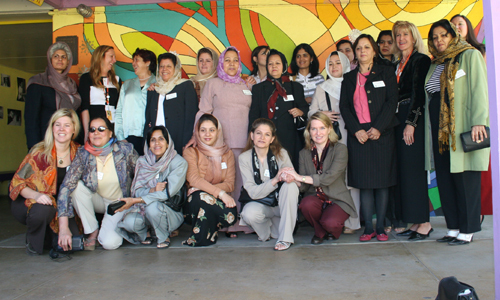 I was able to get to know the other fourteen Afghan businesswomen that attended the seminar. We shared our knowledge and learned ways to expand our businesses. I learned many new ways to run my business. The most important thing I learned from visiting different businesses in Arizona is that all of them started from nothing. Their passion and commitment made them successful. I have met wonderful professors and administrators at Thunderbird University. They welcomed me and taught me how to be a professional businesswoman. I even received a mentor for two more years. Desnos died in a concentration camp during World War II trying to help the oppressed people of France. He was part of the French Resistance. Looking back on my experience in 2006, I realize how much I have achieved. This experience changed my life completely. It gave me the vision of what I want to be and how I can add value to my business. It taught me how to be more useful to other businesses in my country. I have learned how to be united with the women of my country, looking at the cultural, racial, and gender oppression that we face. I am fortunate to be going back to Thunderbird University again to attend Project Artemis in 2010. It is not an accident that I am returning. I have worked hard for this opportunity, but it would not have been possible without the help of the fourteen Afghan women who became my support network. Thanks to these women, I am a responsible businesswoman and a responsible Afghan citizen. My goal for the 2010 Project Artemis is to share my experiences with other women. I want to stress to them that these two weeks are only the start of a long journey. If the Afghan women who participate in this seminar use the resources and opportunities that are made available to them they will thrive in Afghanistan. United we Afghan women can make history. United we can change the economic situation in Afghanistan and make our country strong again. United we can beat oppression. I really loved reading about your experience at the university. It’s so amazing how you not only learned how to help yourself and your business, but took that knowledge to help others. You are such a caring and compassionate person. Thank you so much for sharing and I hope you keep us updated on this year’s Project Artemis!